Samsung's 650 Series has the Touch of ColorTM design in HD 1080p resolution Plasma TV with Ultra FilterBrightTM anti-glare technology. This TV has a 1,000,000:1 dynamic contrast ratio. Two of the most important factors in overall picture quality, contrast and brightness, achieve new heights in these latest generation plasma panels. Together with the DNIe proprietary circuitry, Samsung's new plasma TV's give the most stunning realistic picture quality ever from a flat panel set. Superb connectivity and networking with 4 HDMI 1.3 ports. Turn your Plasma into a full-scall home viewing gallery and watch your favorite photos in a slideshow and listen to your MP3's with WiseLink (USB 2.0). Samsung's 650 SeriesPlasma can also display Natural True Color with 18 bit processing. And new algorithm adjusting color balance will let you enjoy the 'As-is color'. 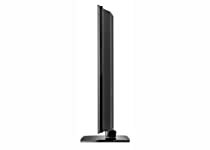 0 Response to "Samsung PN63A650 63-Inch 1080p Plasma HDTV with Red Touch of Color"